While you will name your character and select their pronoun-based gender, you will then pick from four different pre-made characters to take on the role of a student at Spooky High School, an educational center filled to the brim with a variety of different monsters and creatures. The titular Monster Prom is only a few weeks away, and you've yet to ask anyone to be your date. Among your classmates, there are six potential characters that will serve as your intended love interests; Vera, Polly, Damien, Liam, Scott, and Miranda. Scott Howl is your typical jock of the group, as well as the werewolf with a heart of gold. He's a huge fan of Die Hard but really hates vacuum cleaners and fireworks. Miranda Vanderbilt is a genocidal version of The Little Mermaid in that she is a mer-princess who enjoys tyrannical regimes as much as she enjoys cat videos. Liam de Lioncourt is the smug geek vampire that is into bands that may not even exist, and isn't too fond of Vampire Slayers as he finds them very cliche'. Polly Geist, one of my favorites is a party ghost who is always cheerful, lives consequence-free, and dislikes to dislike stuff. Damian LaVey is an intense demon who loves murder, fire, and murdering people on fire. Vera Oberlin, my favorite character of the game, is a teen gorgon complete with two snakes who constantly bicker, but will come together to assist in making her money, famous, and everything else she wants. The writing can be very cynical, crude, and insanely vulgar, but everything works so well based on how they have handled these characters and their personalities. Sure, there are jokes and situations that don't get the laugh I think they wanted from it, but there were several moments of reading the dialogue responses or even the questions at the start of the game where myself and a friend were almost in tears from laughing. While there are still several scenes I haven't discovered or certain conversations I've seen in trailers yet to unlock, the content I have had available thus far has some very smart writing that has had me coming back time and time again. I've completed probably around 25 or 30 full playthroughs so far and have been rejected far more often than I've succeeded, just like in real life, but I keep loading the game up to unlock even more conversations and special endings. 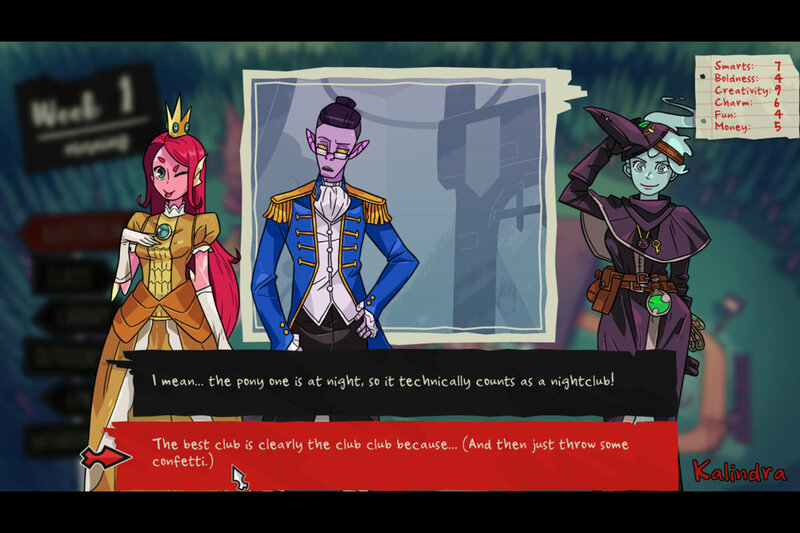 While Monster Prom is meant to be a short experience, You can either play solo or with a group of up to four people. A standard solo game can vary anywhere from around 30 minutes to an hour, depending on the length of game time you set and if you are skipping any parts of the dialogue. After choosing those settings, you will answer a variety of questions that determine certain statistics to your character and a final question that will dictate who you are most likely to romance. The gameplay loop of Monster Prom is simple; you choose a part of the school building to interact with and each location will feature an encounter with your most compatible love interest, usually along with another character or two to shake up the conversation. The answers you give to their situations or requests will dictate if they are warming up to you, or if they would rather see you dead than continue the conversation. Getting on their good side will reward you with an increase to your stats, where choosing the wrong answer will see you lose stats, some of which, like karma, are imaginary. As you get to know each of the possible love interests, it can become somewhat easy to determine the proper answer, but I found a few options that lead to results that seemed to come out of left field. At the end of the final week, you will have to ask someone to prom and there are a variety of endings that can see true love blossom, or have them laugh directly in your face, or worse. The experience you'll have will vary if you chose to play the game solo or with a group of friends. Picking the longer 60-minute option will give you more opportunities to seduce your would-be prom date, but also doing so will have the game show its hand a bit too much and that is one of my only real issues with the game. The shorter experience allowed me to see a variety of different endings and get to know the characters in ways that still left a bit of mystery to them. As I continued through additional playthroughs, I kept seeing several conversations come up again and again. While this is the type of game where you will eventually start to see content repeat itself, I found the shorter experience to be the more satisfying way to work through what is here. The repeating of content is not just in the conversations, but also in the brief moments upon choosing a location to visit. The Gym will always result in a game of dodgeball, hanging outside will always end in a rave, and the auditorium will always see your student performing a play, each and every time. While there are small changes here and there in the text that accompany those images, these moments are in desperate need of variety to keep the experience as fresh and original as its characters. Another location that is mostly static is the shop that will randomly block off locations so that you can purchase items that can unlock special scenes you normally wouldn't have access too, but beware that it prevents you from having a turn at raising your stats towards your hopeful prom date. Playing with friends certainly adds a new dynamic to the game that you don't get if you approach Monster Prom alone. During single player, you can freely choose whichever school location to approach and the reply to choose during a conversation, but most of that changes when you start adding more players to the mix. Whoever has the first turn can pick the first location to visit or which table to sit down at during lunch break, possibly blocking your chance to talk to your love interest should they share the same table. After each round, a theoretical question is asked among the group and it is up to you and your teammates to determine the winner, thus choosing the player to go first in the next round. Should you want to leave it up to chance, you can have the game choose the next player at random. During my session with another player, we encountered a weekend event where I had a discussion with my rival's love interest. Now, I could have turned her against my friend, but you can also bring them closer together depending on your response to their question. Given how multiplayer is set up, there is a very good social game here, and that is somewhat of a weird notion that a dating sim would make the perfect party game, but there it is. The choices between rounds can make for a "cards against humanity" type moment where you create bizarre responses to a simple question and have the group settle on a winner. The weekend events can make for some tense moments where you can ruin another players chances of scoring their prom date. All the key elements of an enjoyable party game are here, it just may come across as an unconventional choice. Monster Prom is a very colorful, bright, and fun experience, and that is largely due in part to the game's sense of style. The character designs are fun, humorous, and fit alongside the menus and overall look of the game. Characters like Vera and Polly are easily my favorites and I found myself repeating the game over and over again to try and earn their favor and unlock each of their special moments. The soundtrack reminds me a lot of the type of music you would hear in old surfing movies and it fits really well here. While each of the characters in the game, regardless of them being the possible prom dates or the background characters that make up the rest of your classmates, we only get small soundbites out of each of them and with how great this cast is written and how well their designs fit their personalities, I can't help but feel that the game would have benefitted greatly by featuring a fully voiced cast. I'm an avid listener of the Co-Optional Podcast, and this was the outlet that made me aware of this game in the first place as two of its hosts were involved in the development of the title. I'm not an avid PC gamer, my website can easily make you aware of that, but I'm not opposed to trying out new games, even of a genre I don't typically enjoy. 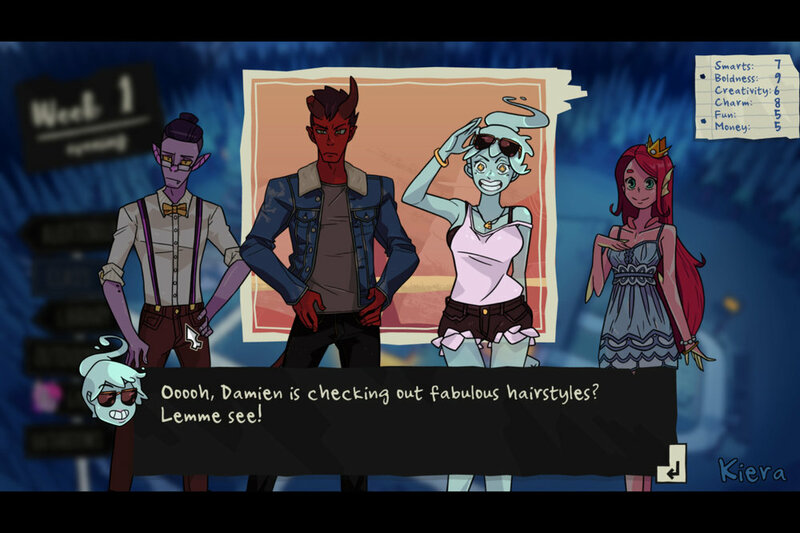 Monster Prom invited me in through the designs of its characters and the overall look of the game, but won me over with its engaging writing, creative personalities, and how enjoyable its multiplayer mode can truly be. 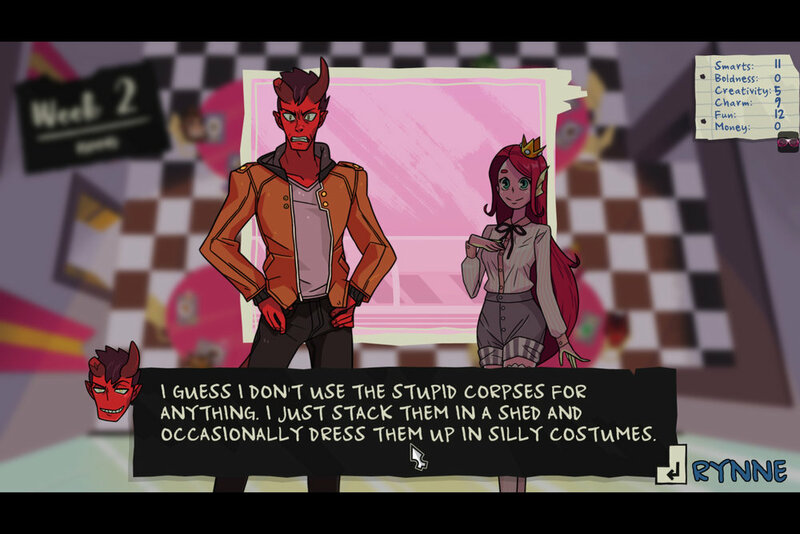 Whether it's choosing the right silverware to enjoy a meal with, setting the school on fire and charging people to exit, or trying to figure out the perfect costumes to apply to a series of corpses, Monster Prom is as silly as they come. monster prom WAS PURCHASED BY THE REVIEWER. ALL SCREENSHOTS WERE TAKEN ON A surface book 2.